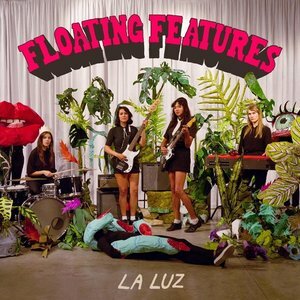 The hot and heavy nature of La Luz's Floating Features is grounded in its ability to comfortably mix rock and folk. Floating Features captures the sound of a dream set in the hottest corners of America. The instrumentation La Luz employs throughout the record is ethereal, like it is too bright for this world. For this Seattle-based band, the album is a road trip from one dream to the next, bringing in the sounds of folk, indie rock, and psychedelia into the equation. This hazy album's weakness then becomes how simple and restrained elements are despite their varying natures. However, these tiny tweaks that utilize different genres are what keep La Luz from being plain. A lot of Floating Features feels drawn from folk contemporaries. Songwriters like Angel Olsen and Damien Jurado are the familiar sounds that come across when listening to the record. La Luz has their own sound, however, one that is "lost inside a dream" ("Loose Teeth"). This feeling of being lost becomes in tune with the sensation of wanderlust and confusion. The record wants to explore love and freedom at a slow tempo, admiring how large the world is and how unfair it can be. These are the elements that drive the album. It is true that each song has a similar feel over differentiating strings. However, the lyrics and subtle genre-swapping pull the listener into the hazy dream state. "The Creature" initiates with a mellow atmosphere a la Jurado, later creating an imaginative being that is larger than life through the lyrics. There is nothing frightening about this creature; though it is vague and harmless, it finds itself centered in representation. It is talked about as a strength and possibly a weakness. It is a peaceful track with a hint of tragedy. Tracks like "Greed Machine" and "Don't Leave Me on the Earth" are imbued with a psychedelic sound. Whether deliberate or not, there is the influence of Jefferson Airplane that seeps into the instrumentation of both songs; they would sometimes coordinate with each band member's vocal tone. The latter song ends as if it is releasing its emotional payload from its bubble. Its flaw is how abruptly it ends, bringing listeners back to the clean and strangely Black Sabbath-sounding introduction of the title track. Lyrically is where the album shows more of its color. "Walking into the Sun" is a slow dance worthy of its words: "What's the use of being cool / All alone inside my room / What's the use of being free / If you give your heart to me." There is so much weight and finality to this song that it is so heartbreaking. You feel so much while the drums and guitars play their smooth lines. You want the dream to be real; you want them to find love and to feel "good walking down the street" ("California Finally"). As warm and plain as this album can be, it beckons you to its imaginary world that is not unlike our own. Its dreams make love and true peace feel like an end goal. Though Floating Features represents it as a road with few bumps, the weight of each riff and word make it a sweltering task in a strange-looking world.